Explore White Pass and take a dog sled ride on a tour from Skagway. Head up to 3,292 feet (1,003 meters) of elevation at White Pass and take in views that extend all the way to the Yukon. See towering waterfalls, glaciers, alpine valleys, huge lakes, and snow-capped mountains. Then ride in a dog sled, meet the puppies, and learn about a musher's life in a remote part of Canada. You'll also pan for gold, hear stories from your guide about the gold rush in Alaska, and have a chance to spot wildlife. Includes activities, transportation, guide, and pickup and drop-off at the ship dock in Skagway. Make your own way to one of the three different docks in town at least 15 minutes prior to departure, then board the 15- to 25-passenger minibus for your tour. Your guide shares informative commentary as you head to White Pass, stopping when possible to see any wildlife along the way. If you're lucky, you might see bears, sheep, goats, marmots, or other native Alaskan animals. You'll also pull over to take in thundering waterfalls, historic landmarks, glaciers, alpine valleys, and the 'Welcome to Alaska' sign and the Yukon sign, and visit the gold rush town of Liarsville to pan for gold in their gold fields. 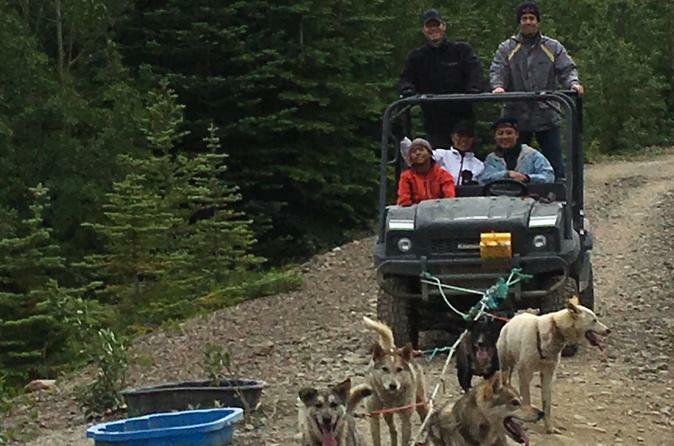 Your sled dog experience includes a ride in a 4-wheeler sled pulled by the dogs. So as not to overtax the dogs, going uphill and downhill the hardworking dogs receive help from the musher. Learn about the art of dogsledding from a Yukon mushing expert, and meet the puppies in the petting yard. Bring your passport for this experience just over the border in a remote part of Canada. Your tour ends with your choice of drop-off at your ship or in town. This was a highlight of our vacation. We were on a cruise and booked this thru Viator because of great past experiences. Loved the 1 hour drive thru scenic area the train ran nearby so you get similar sightseeingbut as a bonus we got to meet Michelle and the dogs and play with puppies! Had plenty of time to play with the puppies then heard from Michelle about the team and race! Went on the ATV pulled by the dogs and it was a blast! Crazy Libby is our favorite husky! Bought a souvenir race bootie in the gift shop which was great. They have snacks , coffee, hot chocolate for purchase. The driver made several scenic stops on the way home, picked wild blueberries and drank glacier water! What a wonderful experience! It is a half day adventure but I would do it again even if the weather wasnt as perfect as it was when we were there! So well worth the trip! We thought we were settling to see the summer camp versus snow/glacier dog expeditions but this surpassed our expectations! We will be cheering Michelle on in the next Iditarod! She has new fans!!!! Love using Viator and have recommended them to other cruisers! This tour is a must! We had great weather for our bus trip to the Yukon. The scenery was beautiful with numerous stops for photo opportunities. The Sled experience was interesting and exhilarating. Amazing to hold and interact with the puppies and adult dogs and learn all about what it takes to train these dogs for competition. Very rewarding day. The ride out to the dog sled camp was nice, tour guide was very nice and informative. We went in August 2017. Its a long ride and some very beautiful areas. However, I do not recommend this expedition. We skipped the helicopter because of the weather and chose this expedition. When we arrived at the dog sled camp, there was no direction and it appeared the staff were uninterested in people coming. We were shuffled to onto a UTV and dogs pulled the UTV for training purposes. Then we sat around while staff ignored us and then we left. You could tell the staff were extremely passionate about what they do, but if I had to guess, if they had it their way they would prefer not to have visitors. I think they are doing this in order to make some money, but are annoyed at the tourist attraction. Im sure they are great at what they do but maybe they should stick to that. When we left we stopped at a gold panning camp. We were allowed 10 mins to get to gold panning area, pan for gold and have a cookie, due to time constraint. All and all I dont know where the problem is but it appears this entire expedition was slapped together without much interest. Save yourself some money and pay slightly more for something else. I gave it 1 star because I would not recommend. I am confused by all the positive reviews. But like I said maybe this was an isolated event. We really enjoyed the tour and especially the dogs! Please note that if you do the tour in the summer which is high season in Alaska, you will not be riding on an actual sled due to the lack of snow. Instead, the dog are pulling a small SUV vehicle but you definitely get the feel. Bring your passports-you will need them as you have to cross the boarder into Canada to go to the dogsledding camp. Our guide was good and it was a very realistic representation of the sledding experience. We were particularly fortunate to see the sled dog pups at 2 weeks of age. The only glitch was that the van we had to get on was not right by the ship and we were not notified that we would have to walk quite a ways to get to it. There wasn't anyone on the pier with a sign as we were told there would be so we had to go on our own to each of the busses and vans and ask until we found the van on our own. The guide/driver was amazing and the it was a one a lifetime experience. Glad we did it. Wished there could have been snow covered ground but the cruises don't go to alaska when it is snowing so maybe will need to fly into alaska to try this again someday. It was fun playing with the puppies and we did learn about the life of the sled dog. The ride was fun even though it was on an atv, the dogs did do the pulling! My only complaint is that the women who worked with the dogs were filthy and not just from that day. They looked like they hadn't had a shower in weeks. 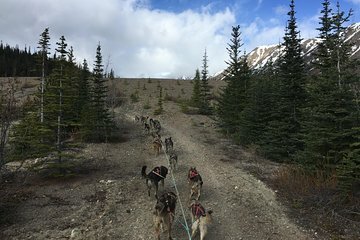 Traveling the White Pass was great and riding with dogs was an incredible experience. The only thing that kept this from being 5-stars was our tour guide who told so many stories we never knew what was true and what wasn't. Panning for gold was nothing spectacular. The dog sled adventure was terrific in all aspects, from playing with the puppies, the ride itself and the time she spent explaining what was needed on the trail. We'd do it again!